THIS VERSION IS NOT FOR MONTEVERDI PURISTS OR PERIOD OBSESSIVES. YOU KNOW WHO YOU ARE, AND YOU HAVE BEEN WARNED. Henze has taken the basic score of Monteverdi’s masterpiece (some will even argue about which of his surviving operas holds that title) and instead of reconstructing it in scholarly, period perfection has, instead, reconfigured the opera for modern audiences whose ears have been exposed to Stravinsky, Orff, Shostakovich and Strauss. His realizations present us a new portrait of Monteverdi’s vision, one painted in broadly sweeping post-Mahlerian strokes. Nearly everything about Henze’s "new opera” is grand and enormous, yet at its heart it does no more than serve the master, ultimately doing what Monteverdi wished; sharing one of the most beautiful, romantic and fantastic tales in human fiction, a story which resonates as strongly today as it did nearly 3,000 years ago. Although the soundscape can be immense, there are more moment when Henze engages a smaller sound, grouping a few instruments together in a Baroque manner, if not the style we’re used to, in representing the very intimate family drama at the core of Homer. The employment of this yields enormous, theatrical results that have an emotional impact as grand as anything from Puccini or Wagner. Jeffrey Tate leads the massive ORF forces in a reading that is difficult to imagine being bettered in any way. One example of this is the revelation of Ulisse to Telemaco, the child whose boyhood he missed entirely, now a young man. Telemaco, has for twenty years ached for his father as Penelope has her husband. At the proper moment, assured of its rightness, we witness the swift, dramatic change from old man to armor-garbed warrior which, in its own right is startling. More startling still however, is the way Henze punches up the musical impact, as Ulisse commands his son to race home and prepare Penelope for her husband’s return. Quietly tender in Monteverdi’s original, the moment now also becomes an emotional charge; no longer merely a son telling his mother of her husband’s return, but carrying out an order to prepare the way for the return of her King! 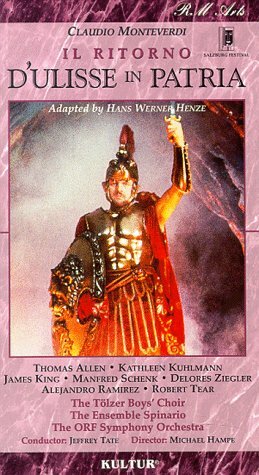 Thomas Allen’s Ulisse presents all of this powerfully both in presence and voice as, with restored dignity, he watches his child race towards his beloved Ithaca. It is a scene that, no matter how many times I watch it, leaves me with a lump in my throat and my skin tingling with excitement. The entirety of the physical production and Michael Hempe’s direction brings ratchets the work up to Festival level, and is nothing but splendid. Chariots and gods, Neptune rising from the sea, with intimations of baroque spectacle and stage machinery bringing us into a world where anything is possible. Allen’s assumption, not only of the title role, but also of Human Frailty where, in the Prologue the nearly naked singer sets the tone for the whimsical and merciless abuse even a hero may suffer at the hands of the gods. As Penelope, Kathleen Kuhlmann is every bit Mr. Allen’s match with a cool reserve that belies the churning of the queen’s ever shifting emotions. She seems both prone towards begging, praying yet cursing the gods and her fate. She also reveals a woman who, alone for so many years has grown to appreciate her role and her status and the attention she commands. Penelope has many sides to her, and Kuhlmann shows each of them and all we can do is watch, respect and, if you’re like me, fall in love with her. Henze, wrote about his examination of the Monteverdi score fragments (making sure to note how none were in Monteverdi’s own hand) as well as the nearly torturous details he pored over in order to arrive at this reconstruction. 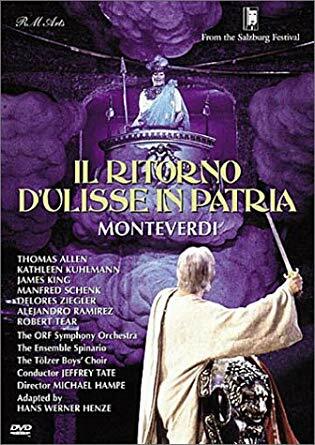 All of it comes through, resplendently, as we hear how he treated every aspect of Monteverdi’s magnificent opera with respect, lavishing upon it detail upon detail resulting in a work which, in its own way, is as emotionally satisfying as Monteverdi’s original . . . or the scholarly reconstructions purporting so to be. Throughout, there is never a false moment or anything rote, mechanical or uninspired. This Salzburg Festival production holds one in its thrall, from its moving prologue, right up through Ulisse and Penelope's final duet, as glorious to see as it is to hear.